• Truly portable and user friendly. • Simple operation results in distance readout to the fault. • No interpretation of complicated waveforms required. • Automated arc-reflection technology (AART) developed by IUP. • Cycle thump mode for pinpointing faults. • Variable charge voltage (0 to 10 kV). • Waveforms captured and viewed with IUP Fault Expert Software. • Cable faults located up to 3,000 meters (1.9 miles). 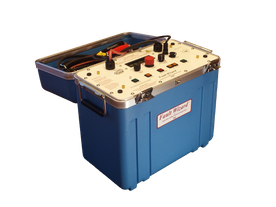 • Battery operated for use in remote locations. 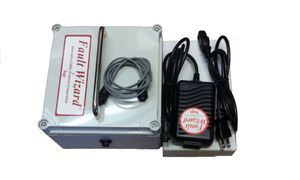 • Auxiliary "backup" lead-acid battery package for the Fault Wizard. 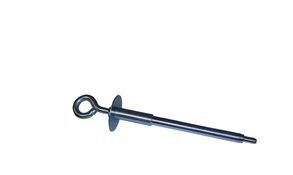 • Allows an extra hour of continuous cycle pulse operation. • By-passes the internal batteries, in case one of the internal batteries has failed. • Grey polycarbonate Battery Box with chrome handles and black connector port. • Black Battery Pack charger with 115 VAC equipment cord. • Grey cables attach the Battery Pack to the 24 Volt Input of the Fault Wizard Panel. 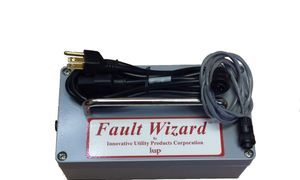 • Powers the Fault Wizard using external 100-240 VAC, 50-60 Hz power source. • Grey cables attach the AC Pack to the 24 Volt Input of the Fault Wizard Panel. • Black cord connects the AC Pack to an electrical outlet. © 2019 Innovative Utility Products Corporation . All Rights Reserved.